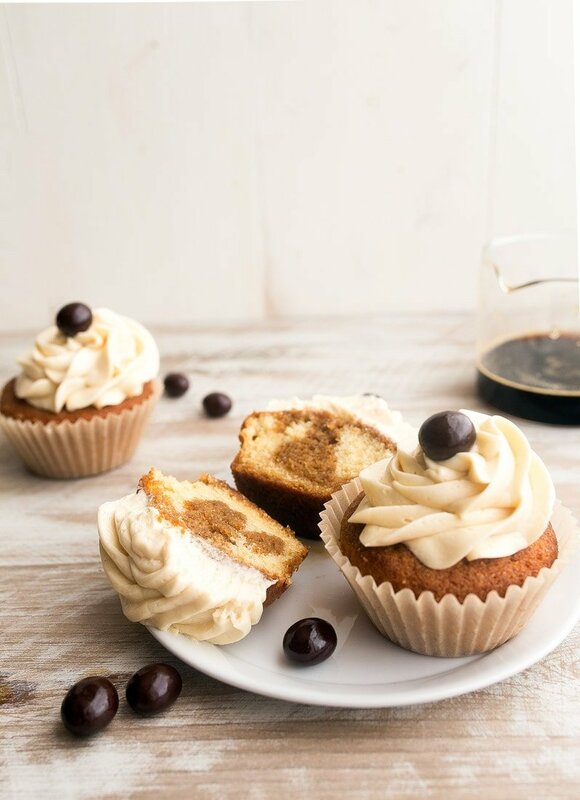 Tiramisu cupcakes for two: instead of a big pan of tiramisu, make these vanilla cupcakes with an espresso Kahlua soak and mascarpone frosting! It’s Friday! You deserve a cupcake. I know it’s the Friday before Thanksgiving week, and you’re probably starting your salad diet (or, ordering stretchy pants (or both)), and a cupcake might be the last thing you need. 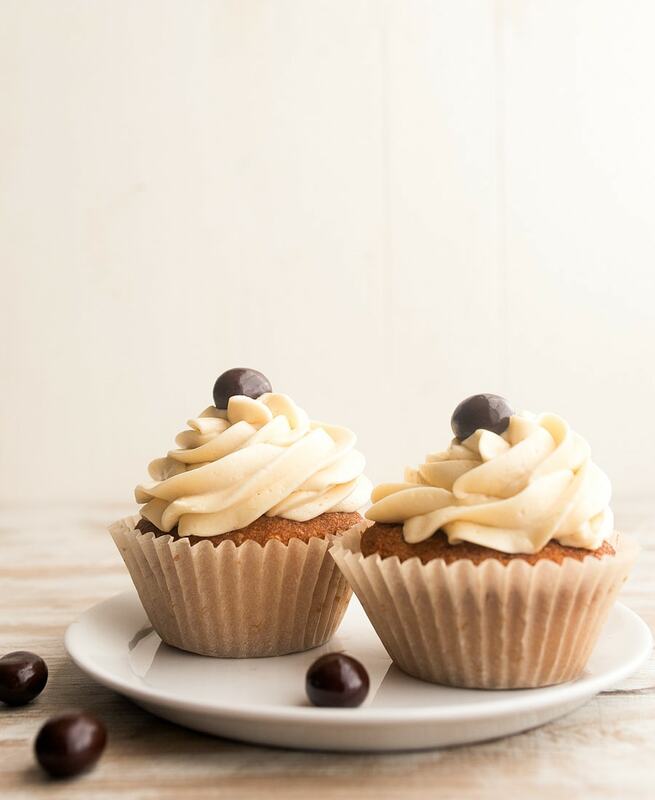 But, I shared a teaser photo of these tiramisu cupcakes on my instagram, and you guys demanded them. And I’m totally cool with that. I love the flavor profile of tiramisu. I love the soft ladyfingers dunked in an espresso syrup made with Kahlua, and I especially love the creamy mascarpone filling. If you’ve never had mascarpone, it’s like cream cheese, but better. It’s sweeter and lacks the tang of cream cheese. I actually prefer it to cream cheese in most applications (except for bagels, of course! Oh, and cheesecake in a loaf pan). If you can’t find it, however, just use regular cream cheese with an extra bump of powdered sugar. While the creamy layer in a regular tiramisu is made up of sabayon plus mascarpone, we’re going to skip that part. These cupcakes deliver all of the flavor of tiramisu without all of the work. This recipe makes just 4 cupcakes, as most of my small batch cupcake recipes do. I hope that’s enough for you to meet your tiramisu craving without going over-board. You can pull a shot of espresso for this, or dissolve the instant espresso powder (I use Medaglia D’Oro brand) into hot water. I’ve done both and hardly notice a difference. You can also substitute Frangelico for Kahlua. You might notice a lack of chocolate in this recipe. That’s because a chocolate-covered espresso bean on top is all the chocolate I need in my tiramisu. If you feel otherwise (and I’m sure you do), you can finely shave chocolate into the frosting and dust cocoa powder on top. Preheat the oven to 400, and line four cups in a muffin pan with paper liners. In a medium bowl, beat with an electric mixer the butter, sugar and vanilla. Beat until light and fluffy, at least 30 seconds. Finally, sprinkle the flour, baking soda and salt evenly over the batter, and then beat until just combined. Divide the batter between the cupcake liners, and bake on the middle rack for 16-19 minutes. When done, the tops will spring back, and a toothpick inserted will come out clean. (They will brown nicely on top because they're made with butter, not oil). Meanwhile, stir together the espresso and Kahlua. 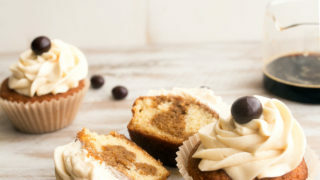 Just before serving, poke holes in the cupcakes using a toothpick, and slowly drizzle the espresso mixture into each cupcake. Then, beat together all of the frosting ingredients until light and fluffy. 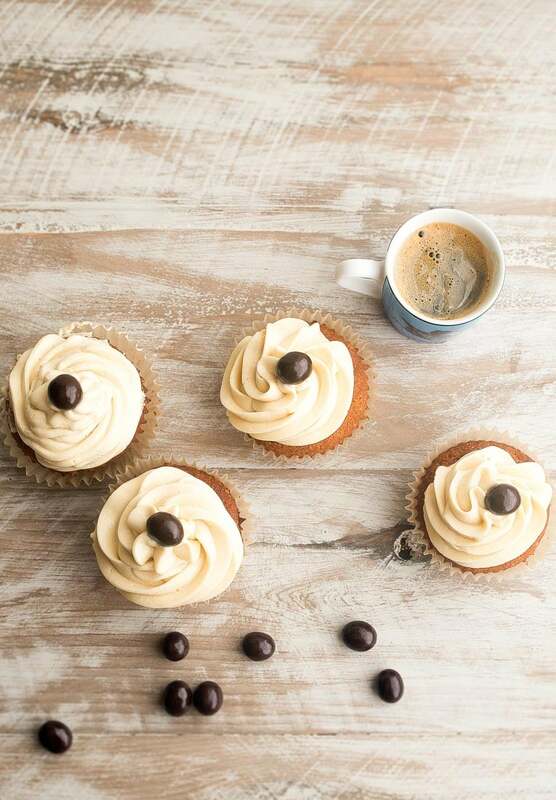 Top each cupcake with a chocolate-covered espresso bean and serve. Is there a reason you have to soak the cake just before serving? I’d like to make this and bring it somewhere, will it get soggy if left too long before serving? Yes, just because they would get soggy. I think you could make them, soak them, and then drive to your destination and be fine. Just don’t let them sit for more than an hour? This looks like my next baking project! Will adaptt he recipe with flaxseed egg to see if it works, cross your fingers on that! I love tiramisu so much, and it’s so hard to find good egless recipes, so anyting that is tiramisu flavored works for me! oh hi, I want you to ask something. if I use coffee with sugar, it will be too sugary? Hmmm….no, I think it would work. What can be used instead of Espresso shot? I do not have an espresso machine. What about espresso powder? Or use leftover coffee? Would it work to substitute full fat greek yogurt for the sour cream? Technically, yes. But sour cream has fat that’s needed in a cake recipe. Greek yogurt doesn’t. Sour cream is 40% fat. usually, Greek yogurt is 0-2%. The flavor and texture will suffer. But your cupcakes won’t sink or taste bad. Sour cream also has acidity which helps with the rise of the leaveners (baking soda, baking powder).